You can find hemlock trees all over New York, but there are only a few places in the state where those hemlocks are considered old-growth. The Mianus River Gorge Preserve is one of those special spots. Located about an hour north of New York City, the Preserve is one of only a handful of places where old-growth hemlocks can still be found on the East Coast. Acquired in 1953, Mianus River Gorge was the first property to become part of The Nature Conservancy network, and in 1964 the Gorge was designated a National Natural History Landmark due to the intact old-growth forest. 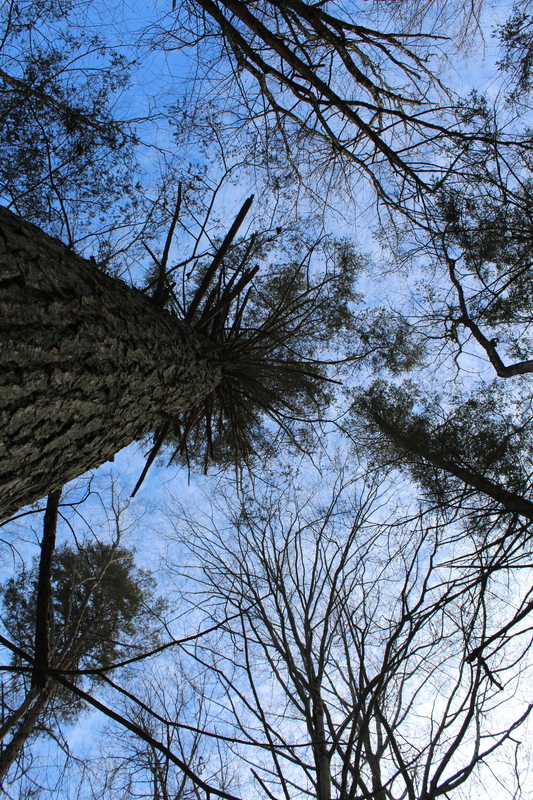 The oldest hemlocks in this forest are over 400 years old and stand at over 200 feet tall. These hemlock trees remind us of what we could lose if we are not diligent in responding to forest threats such as the invasive hemlock woolly adelgid (HWA). HWA has been present in New York since the 1980s, and represents a huge threat, especially considering that hemlocks are New York’s third most common tree. In addition to the myriad of ecological benefits that hemlocks provide, they are also of immense importance in our cultural landscape. The rare old-growth hemlocks like those at Mianus River Gorge not only preserve the genetic diversity of rigorous, healthy hemlock forests in the region, they also preserve the legacy of our old-growth forests all along on the East Coast. Hemlock trees in the Lower Hudson region have been exposed to HWA for many years, and the trees at Mianus River Gorge are no exception. 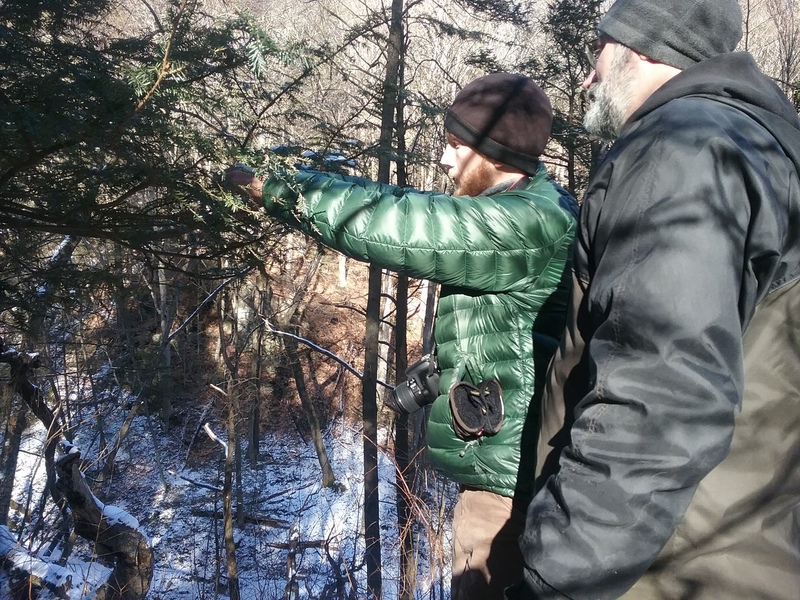 In order to prevent decline and die-off of large trees, the staff scientists at Mianus River Gorge Preserve have been working with Cornell Cooperative Extension to develop and enact a management plan to save the Gorge’s hemlocks. The plan involves an integrated approach, using pesticides and biological control to successfully manage HWA. As part of these management efforts, New York State Hemlock Initiative technician Nick Dietschler joined Mianus River Gorge Preserve’s Director of Research and Education Chris Nagy, and Director of Land Management Budd Veverka last week to release the biocontrol insects Laricobius nigrinus on several of the trees at the Preserve. The beetles were provided by the biocontrol lab at Virginia Tech, a leader in HWA biocontrol research. 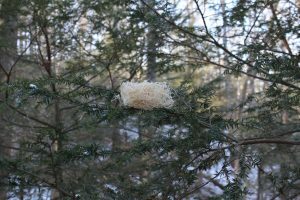 Laricobius beetles released here will help protect some of the Lower Hudson region’s only healthy hemlock stands and provide a welcome addition to the management plan that has included the treatment of over 600 trees so far. 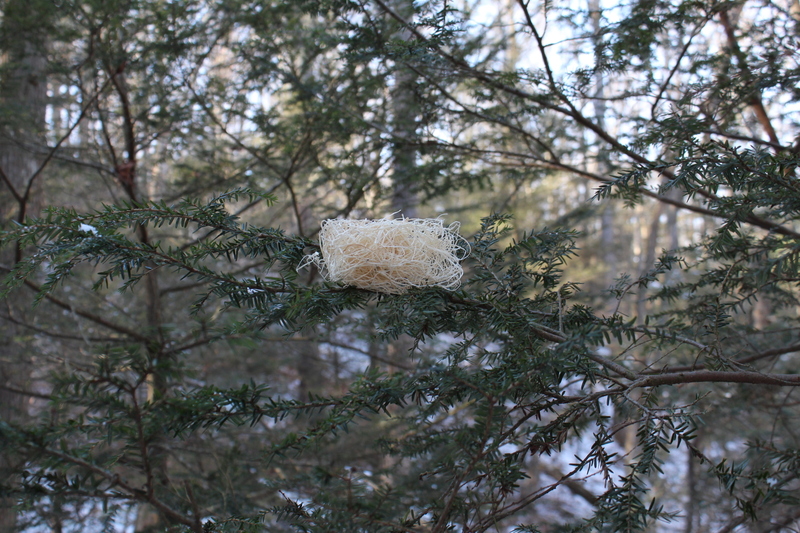 This bundle of straw stuffing is full of Laricobius beetles and is placed on a low, HWA-infested hemlock branch to allow the beetles a good site to begin their biocontrol journey. With the combination of chemical treatments and biocontrol releases, Mianus River Gorge Preserve will be able to save the character of Eastern old-growth forests and continue to provide a sanctuary for the many animal and plant species that rely on the ecosystem hemlocks help create. Bobcats, bears, deer, birds, and freshwater fish species all rely on hemlock trees for food, shelter, and shade. In addition, beautiful native plants like lady slipper orchids thrive in the acidic soil conditions that hemlocks help create. The Mianus River Gorge hemlocks are also responsible for providing clean water to the Mianus River drinking water system. Losing hemlock trees would result in a decrease in water quality, which would have large economic and health impacts in the region. Without the hemlocks in this forest, the fragile ecosystem in this region will fall apart, a result that would be devastating for humans, animals, plants, and fungi alike. Keeping the forest intact by preventing the death of hemlock trees in the Mianus River Gorge will make us responsible stewards of the land, and of our selves. NYS Hemlock Initiative technician Nick Dietschler releasing Laricobius beetles at Mianus River Gorge Preserve last week. 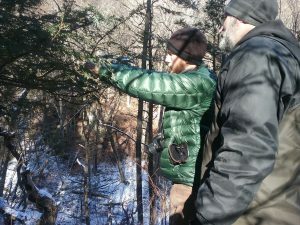 The New York State Hemlock Initiative fulfills its mission of hemlock conservation in part through biocontrol research. While the HWA predators released at Mianus River Gorge were not supplied from the NYSHI lab at Cornell, our lab colony has just begun to lay eggs and we anticipate a healthy, expanding colony this spring. We are planning L. nigrinus releases for Fall 2018, as well as releases of Leucopis silverflies this spring. It is our hope that biocontrol methods will become more widespread and effective so that we can maintain hemlock stands at beautiful and unique sites like Mianus River Gorge for many years to come.